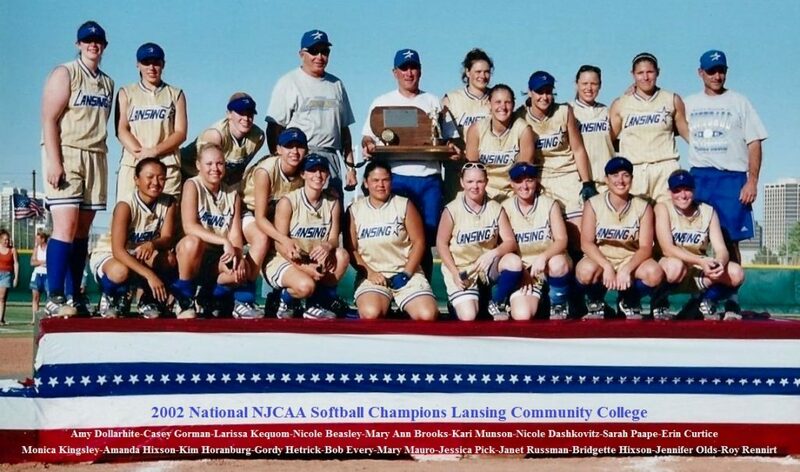 The 2002 Lansing Community College Girls Softball Team became the first NJCAA Softball Team to win the National Championship East of the Mississippi River when they defeated Parkland Community College in Phoenix Arizona at the College World Series. The Stars finished the year with an amazing record of 49 wins and just 7 losses, putting together a 26 game winning streak along the way. They also captured the Michigan Junior College Athletic Association State Title, and the Region 12 NJCAA Title. Five of their starting nine players garnered All American Honors, with the Star’s Jennifer Olds picked as Player of the Year and Coach Bob Every being selected as the National Junior College Athletic Association Coach of the Year.